Terraria is easily one of the best values on Steam, offering countless hours of action-packed sandbox gameplay for an extremely fair low price ($9.99—and it goes on sale fairly often). 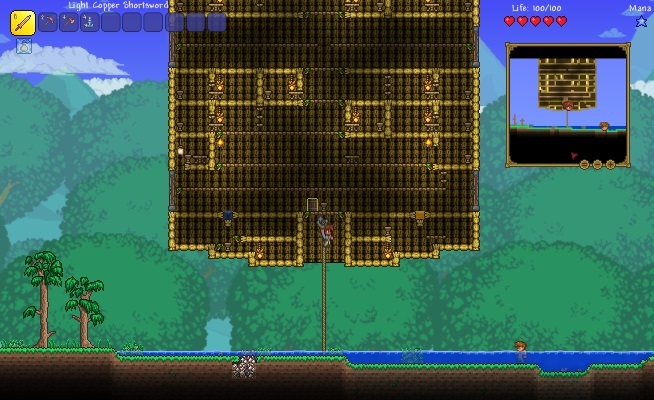 Terraria’s already awesome gameplay is made even better by the incredible mods created by its community, which we’re spotlighting below. If you haven’t yet picked it up, or if it’s gathering digital dust in your overcrowded Steam Library, now’s a great time to get back into the game and check out all of the awesome additions that have come along in its amazing seven years. Do keep in mind that while Terraria is available on basically everything but your fridge, modding capabilities are available only in the Windows, Mac, and Linux versions of the game (sorry!). Unlike many similar games, Terraria does not have Steam Workshop support. 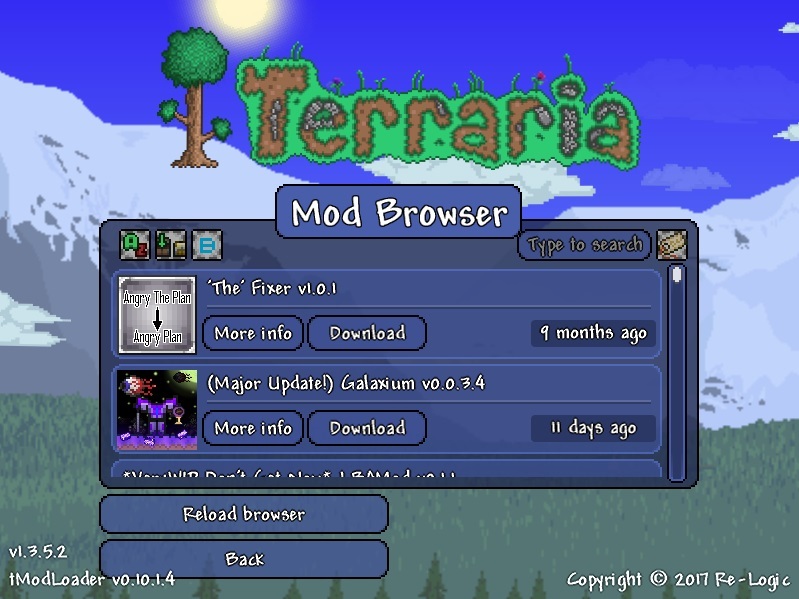 Instead, you’ll use an application called tModLoader, which adds a mod browser to Terraria’s main menu and opens the door to the countless awesome mods within. Also, the game’s Vanilla files and Modded files are kept separate, in case you want to keep playing your “normal” game. If you’re a particularly savvy coder (or even just getting started), tModLoader can even be used to create your own mods. All mods mentioned below can be found within the tModLoader browser. Many will play nicely together, but if you need help we recommend checking out the official Terraria mods and tools forum. tModLoader also has a Discord Channel and a dedicated help thread. These mods focus on offering optimizing certain aspects of the gameplay that can typically be considered annoyances while not majorly affecting the overall difficulty. Magic Storage: Let’s face it: As fun as those items are to collect, they’re a total pain to keep organized. Magic Storage allows you to create an item storage network that allows easy access to your things from anywhere you set up an access point. You can even search, filter and craft! MaxStackPlus: Pretty simple mod that corrects one of the major annoyances in pretty much every game ever. All items except weapons, accessories, and armor will now stack to 9999. Recipe Browser: Minimize your time spent scouring wikis to find out how to craft the bare necessities (and everything else) with the help of Recipe Browser. Search every in-game recipe and view exactly which materials are used to craft it, along with the required crafting station, if applicable. You can search by an item’s name or for words in tooltips, even supporting partial search terms. Recipe Browser also features a complete bestiary and item database. Wing Slot: Wings don’t have their own slot, and they should. 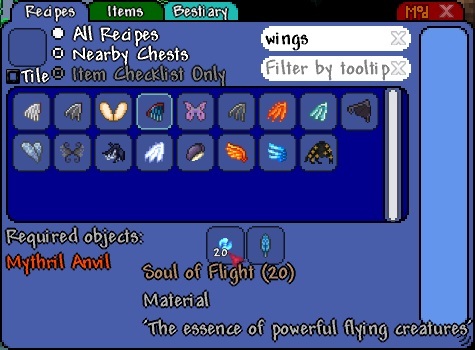 This mod adds a dedicated wing slot for both equipped and vanity wings. Boss Checklist: Boss checklist is exactly what it sounds like: an in-game boss checklist mod that shows which bosses you’ve already killed and lists bosses in a recommended progression order. Simple and helpful. Auto Trash: This mod allows you to specify items to be automatically trashed, reducing clutter (including blocks, materials, etc.) in your inventory. No more manually discarding those unwanted blocks! If you’re looking to take Terraria modification a bit further and don’t mind making things easier, check out these gameplay modifying mods that can help you get the items you need quicker and with less difficulty. Start with Base: This relatively simple mod starts your character off in a new world with an already-established base. The mod offers a small handful of starter bases that are generated at the end of world creation. These bases are designed with your NPCs in mind and can make it much easier to get started in your new world. VeinMiner: This handy mod makes it easier than ever to mine an entire ore vein. VeinMiner lets you gather all blocks in a mineral vein by mining single tile while holding the (remappable) hotkey. There’s even a toggle to make it work for other, non-mineral blocks, too! Alchemist NPC: Vanilla Terraria’s potions are pretty awesome, but can often be difficult to obtain in desired quantities. This mod adds unlockable NPCs that sell most potions in the game, along with select ingredients. These NPCs are unlocked by beating certain vanilla bosses and meeting other requirements. Reduced Grinding: For those players who don’t have a lot of time to play or just want to have quicker access to all the great things the game offers, Reduced Grinding is where it’s at! This mod adds special potions to help make farming easier by boosting spawn rates, toggling events, etc., and improves drop and catch rates of some harder to earn items. There’s even new recipes! Bags of Holding: There’s no denying that inventory management can be a hassle, and Bags of Holding is here to help. This mod introduces craftable bags that can be equipped in your accessory slots to automatically collect obtained items of the selected bag type (fish go into the Fishing Bag, wood goes into the Wood Bag, etc.). This mod is great for providing an insane amount of extra inventory space as items in these bags can stack to absolutely insane limits. Infinity: This mod adds infinite-use versions of consumable items, such as potions, arrows and torches. One less thing to worry about! If you’ve already played hundreds of hours of Vanilla Terraria and are looking for something new, you may consider one (or more) of these awesome overhaul mods. Each mod adds a ridiculous amount of new items, NPCs, bosses, biomes and so much more. Check out each mod’s thread to see what’s in store for you. Additionally, many of these mods have their own wikis, which are linked in the official tModLoader thread. If you’re in the mood for something other than the traditional Terraria gameplay experience, check out these “god mode” style sandbox mode mods that let you have fun and play around with the game’s features. Cheat Sheet: This mod is basically Vanilla Terraria in sandbox mode, granting the ability to spawn any item, NPC, etc. you want. There’s even in-game TEdit (mentioned below) features, allowing you to paint sections of the map and copy-paste content. This one’s certainly not for a “legit” gameplay experience (after all, it does have cheat in the name), but is still totally fun to mess around with. Hero’s Mod: This mod focuses more on a server management and administration, adding extremely useful tools that are helpful for anyone running their own Terraria server. You can control time, ban players, spawn NPCs, protect map areas and more. 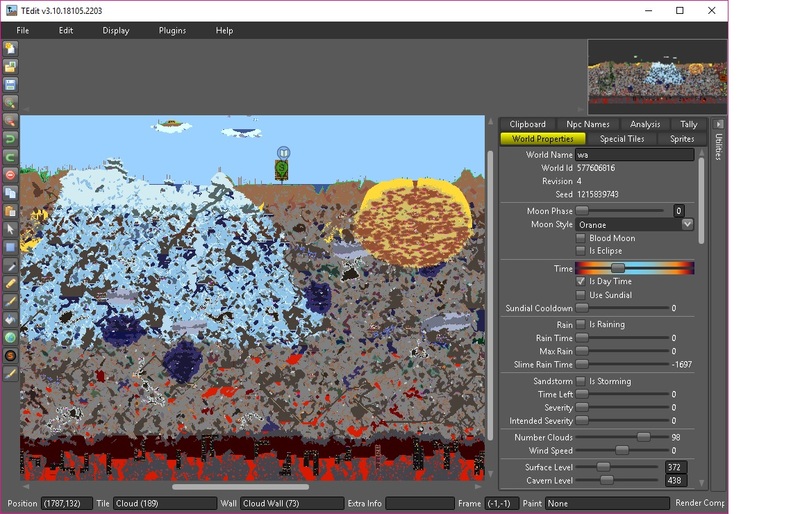 TEdit: While technically not a mod, TEdit is a standalone map editor that is an absolutely invaluable tool for Terraria players. If you’ve ever seen ridiculously complex pixel art-style creations on Reddit, chances are that some of them may have been created with the help of this program. TEdit lets you load your existing world and make changes to it in a grid-based editor, offering paint-like tools to add and create pretty much anything you want. Unfortunately, this program is available for Windows users only. TerraMap: Also not a mod, this standalone application lets you view your entire Terraria world. Simply load in your world’s save file and you’ll be able to view all blocks, ores, items in chests, dungeons, NPCs and more. This can be helpful to locate specific biomes and chests, but can certainly take the fun out of exploring the map on your own. The developer is also working on a web-based version of the tool, which you can find here. If you're using Steam Cloud Sync, the files will be in a different location.